Basic Hospital Software is a comprehensive ready to use software designed to manage and automate the operations of Basic Hospital which includes Patient Appointments, Registration of Inpatient/Outpatient, Investigation Management, Cashier management, Hospital Staff Management, Hospital Inventory Management, and over 200 Individual/Summary reports. 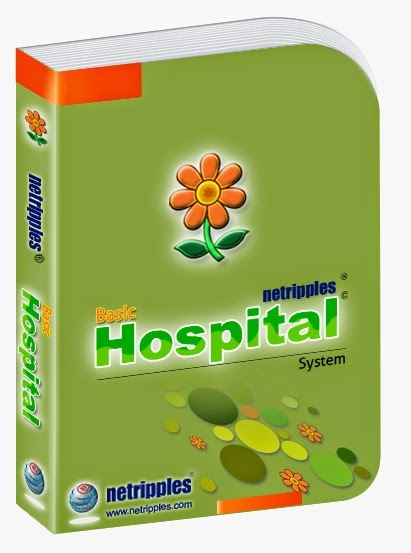 Netripples Basic Hospital Software is a comprehensive ready to use software designed to manage and automate the operations of Basic Hospital which includes Patient Appointments, Registration of Inpatient/Outpatient, Investigation Management, Cashier management, Hospital Staff Management, Hospital Inventory Management, and over 200 Individual/Summary reports. User Friendly Screens with built-in Help, Security & Administration of Software along with Auto Report Headers are other flexible features of the Software. Key Modules covered are listed here. Patient's Appointment Module : This Module covers Speciality-wise OP Clinic Schedule Setup and Administration, Setup Doctors Consultation Time with each patient, Manage Doctors Schedules and reschedules, , Manage Doctor Vacation Management,. Manage Patient Appointments and reschedule Appointments, Doctors & Speciality OP Clinic Based Summary and Individual reports, Connectivity to Patient Registration, Effective Patient Search and Recalls, Holidays Management etc. Outpatient Management Module : This module manages all Out Patients and records transactions with Outpatient Registrations, Medical History, Examinations and other chief Complaints and manages Patient Archives. Inpatient Management Module : This module manages all In-Patient Registrations recording patient Medical History, Clinical Information, Chief Complaints, Treatment Plan, Nursing Notes, Investigation result update, Medical Disorders, recording various medical examinations data, and also manages Patient archives. Outpatient/Inpatient Investigations Management : This module manages Investigation and tests with Test parameter setup, Administration, result entries and also comes in built in standard test Template formats including generating well formatted Test reports. Cashier Management : This module manages all patient payments and include charge collection against the invoices/ Bills generated at various stages and recording the receipts, Payments including cash counter opening cash and closing cash details. HR Management : This module manages and facilitates Employee Registration, Payroll, Employee Attendance and Leave Register, generating Employee Appointments and Offer Letters, generating Employee Pay Slip, recording Employee Promotions and Relieving and Petty cash payments. It also includes various Individual/Summary reports related to HR department along with the setup and control screens for easy customization as per the requirement. List Reports : Contains Users List, Specialty List, Wards-List, Consultant List, Investigations Rate Chart, General Services Chart, Charges Summary, and Referral List. General Summary Reports : Contains Senses Report, and Front Office Day Summary Report. Investigations Related Report : Contains Investigations Status, and Lab Wise Report. Consultancy Related Reports : Contains Consultancy Share Summary, Hospital Share Summary, Reference Doctors, and Doctors Share on Investigations. Inpatient Bill Ralated Reports : Contains Inpatients Bills Summary, Day wise Patient Bill, Nurse Charges, Due Payments, Patients Installments, Patients Insurance, and Patients List. Admissions Summary Reports : Contains Inpatients Admissions, and Outpatients Visits. Cashier Summary Reports : Contains User Wise Cashier Summary, Day and User Wise Cashier Summary, and Day and User Wise Credit Summary.